Our surgery is accessible to patients using a wheelchair. We also have an allocated parking space outside the practice which is reserved for patients displaying a blue badge. There are no steps and there are automatic electronic entrance doors. There is a lift for access to Floor Level 1. 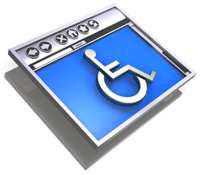 At Darwen Healthcare there is a disabled toilet, and wheelchair users can access a low-level Reception counter.The Reception Desk is fitted with a hearing aid loop system. We can arrange interpretation and translation services by phone for patients who do not speak English. Please let us know if you need this service when booking an appointment. If you need a sign language interpreter at your appointment please let us know when booking your appointment as we need to organise this with a little bit of notice and also we will allow longer for the appointment. All our doctors & nurses have access to Language Line and have an language identification poster allowing you to point to which language you require. Where possible please advise at the point of booking your appointment that you will need an interpreter so that we can allow longer for the appointment. To view the different languages available for interpretation please here.